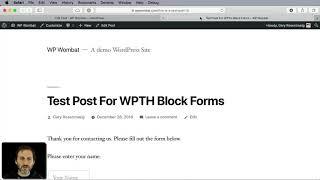 When authors that contribute to your WordPress site look at the list of posts, they see all of the posts, even if they can’t edit them. It would be nicer for them, and perhaps a bit more secure for you, if you could hide all of the posts that are not theirs. I am working on a plugin that lets you create forms using only a single new block. You add a block for each form element, and set it to be an input field, text area, drop-down, submit button, etc. It is pretty easy to use and very customizable. But it may be a bit hard to style depending on what your theme already does with form elements. I would love to get feedback on this idea before I move forward. If you rarely need to move comments from one post to another, then it is probably not worth maintaining yet another a plugin just for that purpose. You can use a tool like PHPMyAdmin on your server to edit the comments database directly and simply change the post ID for that comment. It gets a bit trickier if the comment has replies, but it is just a matter of changing all of the reply comments to the same post ID. 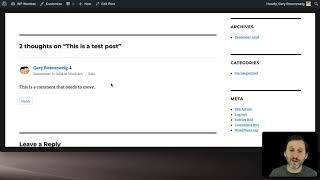 If you want to disable comments for a post, this is pretty easy to do in the standard WordPress admin interface. You can also set a deadline in Settings, Discussions to have comments automatically close after so many days on all posts. But what if you wanted to override that deadline for a specific post or posts? There is one main page I go to in the WordPress controls more than any other. It is the Posts page that lists all of the posts. This is where, as a content creator, I live. I go here to see what is scheduled, to go into any drafts I need to complete, and to start a new post. Yet there is no link to this page in the WordPress menu bar. Beats me why. I think it depends on the theme, but by default you usually see name, email and website as three additional fields at the bottom of all of your posts under Leave a Reply. I guess back in the early days of blogging, everyone had a website. Now in the era of social media, we are back to only the chosen few, like us, who have actual websites. The inclusion of a website field doesn’t make sense anymore, if it ever did. A common thing to need is a list of your most active posts, those being the ones with the most comments. You can get that with a simple call to get_posts using the right arguments. Here is a shortcode that returns the list for you to use in a post, or perhaps in a widget if you have shortcodes enabled for widgets.